Ah, the pub, the great British cultural stalwart, where marriages and families are broken and created, friendships are made and lager is drunk. If you’re still looking for more ale-house action then they have certainly developed an online game for you. Down the Pub features symbols depicting all your traditional fruit machine symbols. Developed by Playson, the best aspect of this video slot is the orange burly gentleman who greets you at the start of this game; a cross between Grant Mitchell, Chuck Norris, and ye da. Spin today and win a huge amount of cash rewards and free spin bonuses. Or you can click to play online slots as well! Based in Malta, Playson is a leading gaming company. With over 250 staff worldwide, Playson boasts a vast experience in many sectors. They are a very successful software development company, providing complete gaming solutions and offering over forty Omni-Channel HTML5 titles that we love here at WizardSlots Casino. Need a night out, then get yourself down to the pub. Down The Pub looks to put you in a traditional Irish pub setting. Wooden serving bar, a jukebox to the side and even a footie match on a big screen bring the atmosphere to life. To top it off, you even have a drinking buddy! Who said you were Billy no mates? For your guidance, feel free to check this list of top games and discover more options. He's a happy chap and occasionally watches the reels spin. If you want to know the symbol play and tallies, simply click on the symbols and a handy information panel appears explaining their role in the game. Control your bet size with the arrow buttons, beneath the reels. Auto play option is available too. Every effort has been taken to replicate a pub ambience. Some little touches to note a flickering bar light behind your drinking bud, an active slots machine and flickering open sign. The graphics are superb and a gentle rock soundtrack compliments suits the game. Fifteen fixed play lines and five reels sit in a wooden backed panel. The reels are decorated with traditional Irish food fayre and pub-related items. We have, a ploughman’s lunch, a beer keg, various snacks and the letters ‘B’, ‘O’, ‘N’, ‘U’ ‘S’ on beer mats. Another symbol is a picture of your drinking bud with the word welcome, this is a scatter. Land three of these anywhere on the reels and it triggers free spins. These begin rolling and keep going until three-pint glass symbols appear. The first pint will apply a 2x multiplier to any wins, the second offers a 3x multiplier and the third a healthy 10x multiplier and you still get one more freebie spin. This a very attractive feature and offers a potential seventy free spins! A four-leaf clover is the wild which will replace all others to form winning combinations except for the drinker scatter symbol and the pint symbol (in free spins). Clock up five beer mats in the right order spelling the word B O N U S and you trigger a really cool feature in the shape of a traditional fruit machine. This is combined with a trail and each spin awards moves around this trail. You begin with three chances and the round ends with the discovery of three bombs, each of them removing a chance. There are loads of good extra features here, such as boosts, nudges, jackpot wins and multipliers prizes. In all, it's worth a night out, down the pub. While the graphics have looked to cover everything, pity the spin button is a tad bland. Perhaps it could have been a beer pump? But this is just a niggle and doesn't impair the gameplay. 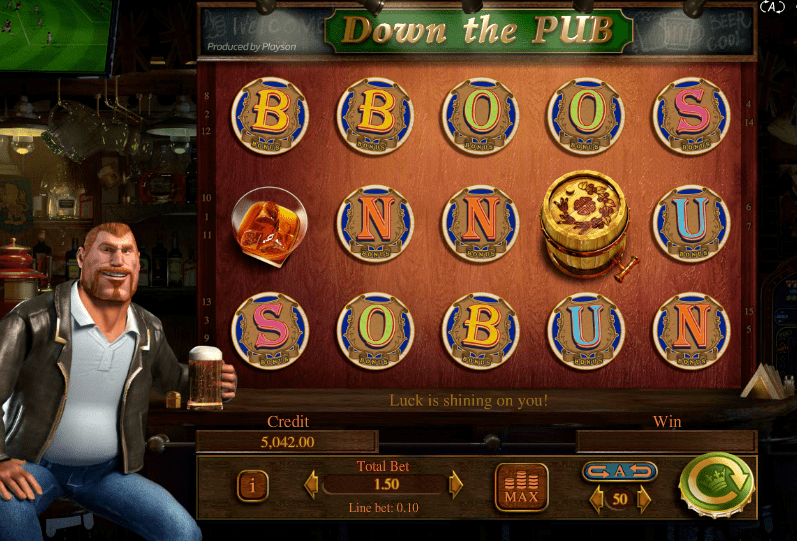 This is a neat slot game that stands out and really gets you into the pub feel. It sets the mood very quickly, has an attractive game design and style and has made the effort to make sure there are plenty variety and gameplay that will see you on your way to some wonderful cash prizes.